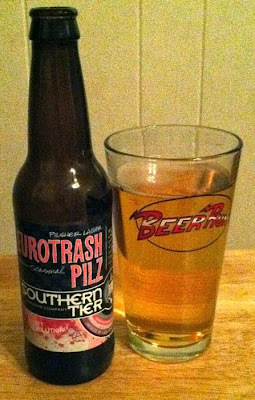 With an apparently tongue-in-cheek name like Eurotrash, I don't think Southern Tier expects people to fall all over themselves praising their light, bright pilsner. And, it's not an amazing beer, not really even up to Southern Tier’s standards. But overall, it isn’t bad. Eurotrash pours really bright and clear, lots of carbonation, medium head. The aroma is mildly sweet and fruity. Mildness seems to be where pilsners register, or at least that is how they hit my palate . This one certainly is mild. The malt is sweet but not rich. It’s crisp. Thin. But I don’t mean to say this beer isn’t enjoyable. It’s pretty OK.